I started doing stained glass about six years ago. One of my instructors had just received a commission to do a stained glass window in a church. As I congratulated her, I expressed my frustration with drawing designs freehand. She shared that she used the Glass Eye 2000 software program. I downloaded the trial version and immediately fell in love with it. Finally, a way that I could incorporate my drawing skills into a program that would enable me to create, edit, resize and save drafts. No more reams of wasted paper. No longer did I have to fight with copiers to reduce or enlarge. I threw my colored pencils away because now I could experiment with virtual colors and textures. I have made many projects using this software but I am proudest of my most recent one: a sidelight and transom window. This fall, while visiting a beautiful duplex in Florida we were going to lease, I noticed plain sidelight and transom windows by the front entrance. I told the owners that I was a stained glass artist and offered to design windows for them if they would allow me to set up a temporary studio in their garage during the time we were leasing. They agreed and indicated that they would like a seaside theme. 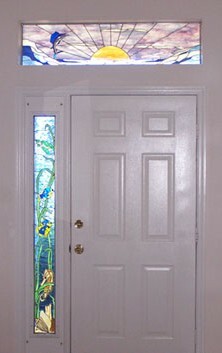 The husband suggested that the transom window include a sunrise while the wife thought that she would like a sailfish. They also wanted the sidelight to block the view from outside while still letting in sufficient light. I went home to my studio in upstate New York and experimented with incorporating seaside and sunrise elements. The size of the windows (the sidelight is 6-3/8" x 64" and the transom is 12-5/8" x 52½") made designing them a challenge. Such narrow dimensions made the selection of elements crucial. I went in search of inspiration for the transom and found it in a former Design of the Month: Prairie Sunrise by Bob and Flory Wilkins. Undersea, a pattern included with Glass Eye 2000, provided elements for the underwater scene. Since the dimensions of the panels reminded me of panoramic camera prints, I tied the two windows together with the sidelight highlighting creatures found under the ocean and the transom depicting the sailfish breaking the surface at dawn. Using the same primary color of glass for the water in both windows helped to tie them together. I love experimenting with textures and colors. In the transom, I used Spectrum Opal Art Mixes glass with Indigo/Pink for the sky, Inferno for the sun, and Thunderhead for the contrast color in the sailfish. For the sidelight, I used a green hammered cathedral for the turtle shell, bronze rough rolled for the turtle underside, a white/light amber granite for the outer surface of the conch and white/light amber iridescent for the inside of the conch. I sent preliminary drawings to the couple via email and they gave me input. It was simple to incorporate their suggestions and after a few exchanges we agreed on the final designs. It was exciting to have the ability to make the project a joint effort between artist and client especially since we were 1200 miles apart during this phase. Once I started making the windows I realized that I had to modify the transom drawing due to the size and grain of the glass I was using. It was no problem to go back to Glass Eye 2000 and make those changes immediately. I was able to print out new pattern pieces within minutes and get right back to work. Being able to make such quick and easy modifications eliminated any downtime. Since the windows were being made to fit in to existing spaces, it was critical that the patterns be exact. The ability of Glass Eye 2000 to put a frame around the design was extremely helpful in insuring a correct fit. I definitely breathed a sigh of relief when both fit perfectly! The owners were thrilled with the final products. "WOW! Absolutely fabulous! You really did an outstanding job on the glass. It's really better than we could have imagined! Thank you! Thank you!" 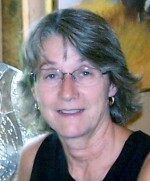 Mary Beth has been drawing and painting since she was a young girl. She began doing stained glass six years ago by taking courses at Brennan Stained Glass in Syracuse, New York. She recently retired from education and although she still does independent educational consulting her first love is designing and making stained glass. Mary Beth recently opened a small studio, Serenity Hill Stained Glass, in Fabius, a little town just outside of Syracuse. She winters in Florida but always brings along her glass and tools! She can be reached by email.